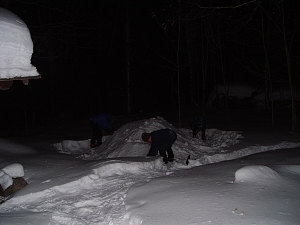 Our intrepid hiking group has a couple of members (me included) that thought it might be fun to try our hand at some authentic winter camping. 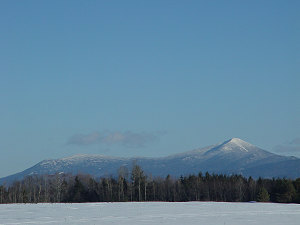 And what better way to do that than coupled with a winter climb of an Adirondack peak? So, calendars were checked, dates were set, locations picked. 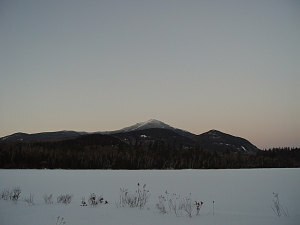 Our objective was to do a 2-day trip up and over Whiteface and Esther mountains. 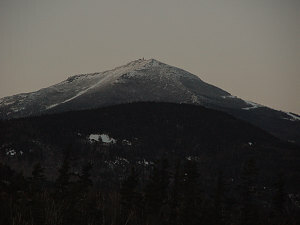 Whiteface is an excellent peak, and, in my opinion, even more so in the winter when the tourist facilities at the top are completely snowed-in. 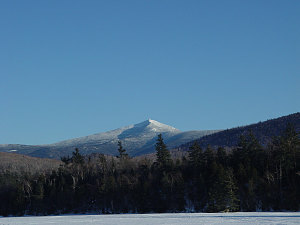 Esther is a 46er peak that I had not done, and since it is easily reached by a ridge connecting to Whiteface, I had hoped to include it as well. 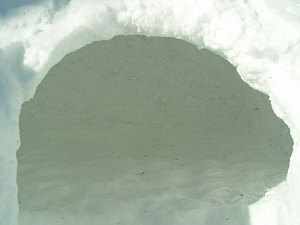 Caroline, one of our winter-camp experts, had suggested that we built a snow-shelter and camp in that. 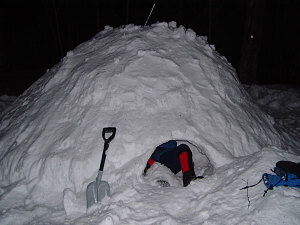 A properly built snow shelter will have temperatures approaching zero - much more tolerable than -35C!!! 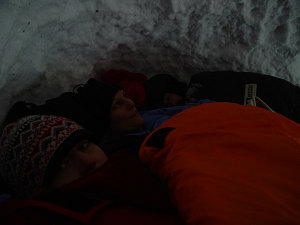 In all, four of us decided to try our hand at the overnight option: Ewart, Caroline, Deborah, and myself. Four others decided that they were not ready for such hardships, and decided to join us only for the day hike portion: Pu, Markus, Adelia, and Bryan. 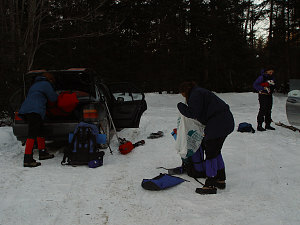 After some complicated logistics, Caroline, Deborah and I started off at 5pm on Friday night. 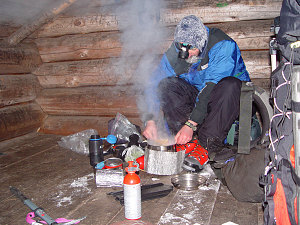 It was co-oold... below -25C at that point. Hiking briskly is a good remedy though, and soon we were de-layering as we hiked the mostly level 7km in to the camp area at the Whiteface lean-to. 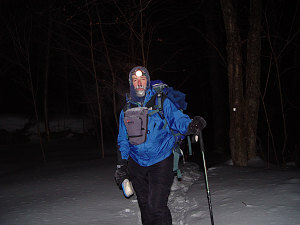 The crisp, clear skies and brilliant full moon allowed us to hike without headlamps. Notice picture #7. It is a 30 second exposure taken completely by moonlight. Ewart, who was about an hour behind us schedule-wise, caught up to us just before the campsite. 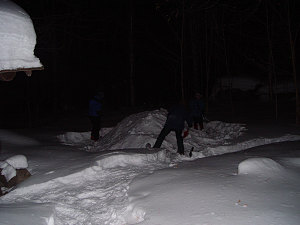 He had offered to make supper, and additionally felt guilty about not helping with the building of the snow-shelter. Very thoughtful of you, Ewart. Thanks! Our camp spot was located right at the Whiteface lean-to, which we used as a place to dump our stuff and make food. 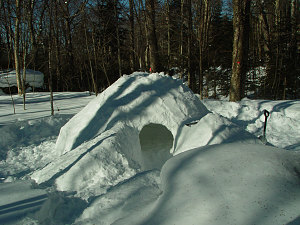 The first order of business was the building the snow shelter. 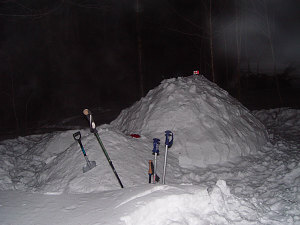 This involves building a huge round mound of snow, and then hollowing it out. We had to make one big enough for all four of us, and so it ended up being pretty large. Have a look at the pictures of the piling process (took about an hour to do). 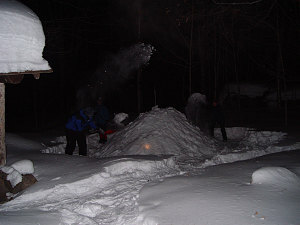 After piling all of the snow into a mound, Ewart went off and graciously start cooking us our supper. He had brought pasta, brie, ham, beans, onions, sliced almonds and herbs, and was melting and simmering all of it into a delicious concoction. Meanwhile, Caroline started scooping out the interior of the shelter, with myself and Deborah acting as a human conveyor belt, transferring the snow outside. 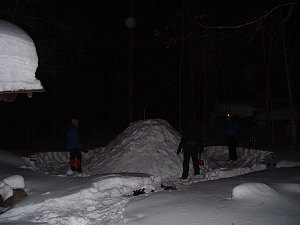 Sticks were poked about a foot into all sides of the snow mound so that Caroline could achieve the proper thickness of walls as she scooped out the inside. The hollowing process was 2/3rds complete when Ewart gave the supper call - again, thanks, Ewart! The supper was great! And, to top it off, he even did all of the dishes (definitely we need to get Ewart on more of our trips!). A bit more scooping and the shelter was ready. Soon, our bedding was inside, along with all of us. A thermometer, hung next to the shelter, read very close to -30C at that point. We were definitely counting on the insulating properties of the shelter to help us out! 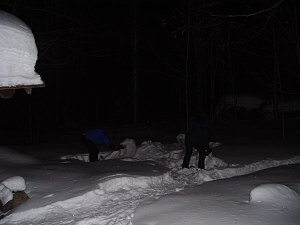 Since we did not have a proper closed-off down entrance (not enough snow depth), we just stuck a pack in front of the opening, which was not perfect but better than nothing. As it turns out, we were all adequately warm, and in some cases overly so (Deborah was so hot she started to perspire!). So, apart from some bits of snoring and a bit of worry on Deb's part about the integrity of our shelter, we had a pretty good sleep, all in all, considering the sub -30 temperatures!